Freeview set-top boxes allow you to access over 40 channels of digital TV without subscription. Boxes can be purchased for a one-off fee starting from around £20. Below, you’ll find a summary of the range of UK Freeview set top box receivers, and some advice on how to pick the right set-top box for you..
SCART sockets: All boxes have at least one socket, but if you’re looking to connect to both a video and a TV that have SCART sockets, you may want to consider getting a box with two SCART sockets. Subscription Card Slot: Some boxes have a card slot that can support subscription services. Handy if you want to get a subscription service, such as ESPN sport. Hard Disk Recorder: If you’re looking to get more from your box, consider a box with a hard-disk recorder. This allows you to record Freeview programmes onto the built-in hard disk – it’ll change the way you watch TV. Some have twin tuners to allow watching one channel whilst recording another. GOODMANS GDB18FVZS2: Basic box with 2 SCART sockets. Amazon / Currys £25 BT YouView: Freeview HD recorder plus on-demand content. Following on from BT’s first offer, BT Vision, the YouView service offers live TV from Freeview, and TV-on-demand via broadband. The box has a twin-tuner, supports Freeview HD and records hundreds of hours of telly. YouView is designed for those wanting a little more than the basic Freeview service. You can buy a YouView box for a one-off fee of around £250, or get a free box with your broadband from either BT or TalkTalk. Want Freeview without having to clutter up your TV system with a set-top box? Then this could be the answer. This adapter from Bush plugs into the back of your TV’s SCART socket, and lets you receive the Freeview TV and radio channels without a set-top box. An infrared pod plugs into the idapter, so that the remote control can work. The Idaptor supports the 7 day programme guide. Available for £19 from the Tesco Direct website. More on our Fetch TV page. The first YouView box on the market. Offers catch-up TV, Freeview HD and on-demand content over the Internet. Features: 8 day EPG, twin tuner and access to Internet services such as BBC iPlayer via the Humax Portal. More details on our Humax HDR Fox T2 page. Available in February 2010 for around £180. Full details on our Humax PVR9300 Review. Freeview HD, support for Dolby Surround, Ethernet socket and 8 day programme guide. Supports playback of DivX, AVI, MP3, MP4 and MKV content via USB. Freeview box that has an RF Modulator, handy for TV sets without a SCART socket. Has 7 day programme guide, 2 SCARTs and digital audio out. OK – So this is not a Freeview box – it]’s a Freeview desktop telly, but we thought it was worth a mention. 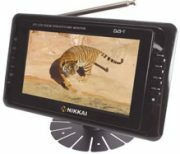 Capable of getting Freeview and analogue telly, this TV can also watch DivX video, play MP3 files and show a slideshow of pictures via a connected USB stick. Top quality DVD recorder with built-in Freeview tuner and HDMI upscaler, for better picture. DVD Recorder: DVD-RAM, DVD-R, DVD-R DL, DVD-RW, +R, +R DL, and +RW. Has an HDMI socket for use with High-definition TVs – 1080p upscaling. 400Gb HDD Recorder (for up to 700 hours), Freeview Tuner and DVD recorder. DVD Recorder: DVD-RAM, DVD-R, DVD-RW, DVD+RW, DVD+R, DVD+R DL, DVD-R DL. Supports DivX, MP3 and JPEG compatible. This box has an RF modulated output – handy for TV sets that don’t have a SCART socket. Also supports connection by SCART, digital audio out and a 7 day programme guide. Features: Electronic Programme Guide, digital text. Features: 7-day Electronic Programme Guide, auto retune, interference suppressor, low energy. Features: 8-day EPG, HD resolutions up to 1080p, surround sound support, low power consumption, auto-switch off. A powerful box that offers: Freeview HD, twin Freeview recorders, plus Internet TV using the Fetch TV service. Launched towards the end of 2008, offering Freeview, hard disc recorder, and video content over broadband. Specs: 320GB drive, Freeview HD receivers, wi-fi, USB and BBC iPlayer. More on our Technika Smartbox page. Twin tuners, 160Gig hard disk (up to 88 hours recording time), supports time-shifting & dual recording, Electronic Program Guide (EPG), MP3 via USB 2.0 for storage of personal files. CI slot suitable for subscription services. Became available April 2005. Ultra-small box, works with TV sets that don’t have a SCART socket. Has an 8-day Electronic Programme Guide and is energy efficient (1.5 watts). Receive digital TV on your PC. Run either in full-screen mode making your PC monitor behave as a TV, or having a smaller TV screen sitting in the corner of your desktop while you work. This model is a ‘hybrid’, so supports both analogue and digital. AverMedia and Nebula – See the range at Misco and www.maplin.co.uk (under the ‘Computers’, ‘Build your own’ section). Boxes are available from: Currys, Argos , John Lewis and Littlewoods Direct. I have a Sagem Freeview HD Set Top Box that does not NAME or give DATES in the ‘Library’ of RECORDED programmes, only the Channel, I have done myself – makes it very difficult to FIND the one you want to watch!! Can you please tell me which Set Top Box will give me all of this when I record a programme? It seems I will have to buy a new one, which is the best, reasonably priced?